LEAN ON PETE at The Avon. 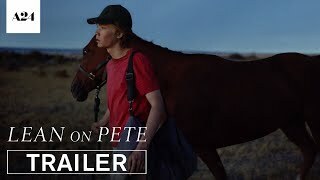 From acclaimed filmmaker Andrew Haigh, and based on the beloved novel by Willy Vlautin, comes LEAN ON PETE - a deeply moving story about love, loneliness, family, and friendship, told through the unique prism of one boy’s connection to a very special racehorse. Fifteen-year-old Charley Thompson (Charlie Plummer) arrives in Portland, Oregon with his single father Ray, both of them eager for a fresh start. While Ray descends into personal turmoil, Charley finds acceptance and camaraderie at a local racetrack where he lands a job caring for an aging horse named Lean On Pete. The horse’s gruff owner Del Montgomery (Steve Buscemi) and his seasoned jockey Bonnie (Chloe Sevigny) help Charley fill the void of his father’s absence. When Charley discovers that Pete is bound for slaughter, he takes extreme measures to spare his new friend’s life.